Carlos meets me at the front door and chats as if we were old friends. Ele (L) arrives and asks what’s going on. She is casually dressed but when she finds out that the interview will also be about her, she immediately leaves to get dressed up. She brings over one of Carlos’ favorite T-shirts and dries his forehead with a napkin so that the camera won’t pick up on the sweat. He lets her fuss over him with all the naturalness of someone who is part of a well-practiced ritual. It’s that kind of marriage dynamic which over the course of many years has granted each partner their specific role and function. And it looks like they love it. They have been together for over forty years. They have founded one of the most highly respected groups on this island of musicians. Together they have created a family with children named after the alphabet just like their mother—Eme (M), their daughter, and Equis (X), their son—who have turned out to be artists in their own right. The kids, as they still call them, have by now left the family nest and started their own lives and careers but they still have projects in common. “I like to think that Eme is still a part of Síntesis even though she isn’t always playing with us,” confesses Carlos. Right away he starts to talk about the recently inaugurated (February 13, 2014) Fábrica de Arte Cubano, the multicultural brainchild of X, set up to mingle all the art forms. “In a way, they are part of all our projects and we are also a part of theirs. So we are a very united family even if we don’t all live under the same roof.” He speaks frankly, with Ele pitching in with a reminder or a date. She is the one who brings us some of their personal file material to illustrate the interview. “She’s been keeping it all organized,” Carlos says with admiration. In 1974, Carlos Alfonso founded the Tema IV Quartet which had Carlos as its band leader and guitarist along with Ele Valdés and some other musicians. Two years later in 1976, wanting to expand their sound, Carlos got together with Mike Porcel to start up Síntesis, a vocal-instrumental group based on keyboard, guitar bass guitar and Cuban percussion. 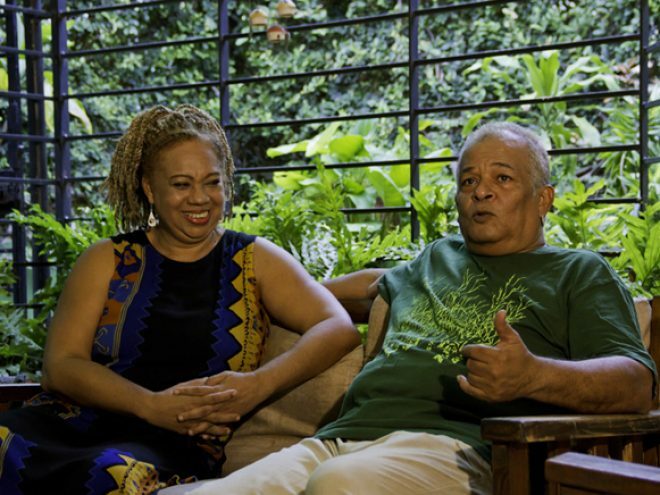 In its long trajectory, the group has undergone many changes determined by the entry of different musicians such as Lucía Huergo, José María Vitier, Amaury Pérez and Ernán López-Nussa, just to name a few. The changes were also inspired by Carlos’ experimentation. He has been the undisputed musical leader whose esthetic concerns have been one of the basic cornerstones of Síntesis. Besides their numerous recordings, during its long lifetime, Síntesis has participated in the most important Jazz and Rock festivals around the world. They have shared the stage with soloists and groups such as Iron Maiden, Swing, Oasis, Guns and Roses, Milton Nascimento, Britney Spears, Fito Páez, Juan Carlos Baglietto and many more. Their music has been used in documentary and feature films and in 1990, they received the Coral Award for the Best Soundtrack at the New Latin American Film Festival for the Humberto Solás film Miel Para Ochún. In 2002, Carlos Alfonso was nominated for a Latin Grammy in the category of Best Contemporary Tropical Album for Habana a flor de piel. At one point, Silvio Rodríguez who is the most prolific and well-known proponent of the New Cuban Trova said about them: “They are consistent with their work and have enough talent to make real, in terms of sound, everything they have set out to do as philosophy and line of thinking: a cultural synthesis. That’s something very few people can achieve.” And after these words by Silvio, there is not much else to add. Except perhaps to emphasize what a great time I had in the company of this couple who, besides their incredible professional success, seem to have found what we are all looking for: Happiness.